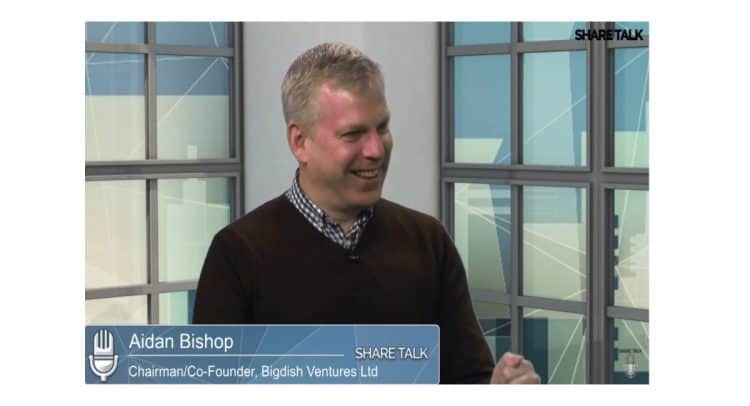 BigDish Plc Founder & Chairman, Aidan Bishop talks about the recent IPO to the main listing market in the UK. He states he finds it laughable that people are equating social media activity, PR, marketing that a placing is imminent, a placing is absolute nonsense. 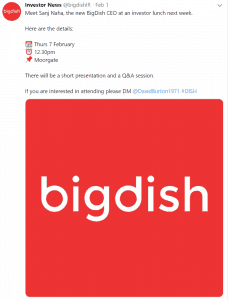 BigDish Plc (LON: DISH), a food technology company that operates a yield management platform for restaurants. BigDish Plc announces that Sanj Naha will be appointed as CEO of BigDish in mid-February. Mr Naha has significant experience in restaurant and hospitality technology platforms in the UK and Europe and has held senior positions at companies such as TripAdvisor and Bookatable. Furthermore, he has worked as a consultant for large restaurant groups in the UK. He has also sat on the Board of four technology startups, which were successfully bought out. Territory One will target the following locations and their surrounding areas: Bournemouth, Southampton, Portsmouth, Basingstoke, Guildford, Dorchester and Weymouth. Territory Two will target the following locations and their surrounding areas: Bristol, Gloucester, Bath, Swindon, Oxford, Windsor, Slough, Exeter and Plymouth. The Company targets at least 200 restaurants for each territory. Restaurants are selected based on their TripAdvisor rankings and reviews to ensure that restaurants of a certain level of popularity and quality are on the BigDish platform. The fundamental driver behind yield management is to use incentives to influence consumer behaviour. BigDish will also be ensuring that a certain level of deal quality is available to consumers at partner restaurants. The Company has concluded its strategic review of the Asian business. It has been determined that the Company is best placed to focus all its resources towards the UK market where faster growth is easier to achieve. 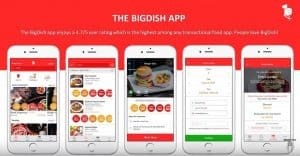 Talks have taken place with a number of large tech companies who have expressed an interest in BigDish. “I am excited to oversee BigDish’s rollout in 2019. We have gathered a wealth of data from the beta testing period conducted in 2018. One of the important learnings was to seek to differentiate ourselves from generalist restaurant reservation platforms by allowing a maximum booking window of 48 hours. This will help us to deliver a genuine ‘last minute dot com’ experience to our users. Meet Sanj Naha, the new BigDish CEO at an investor lunch next week. Here are the details: Thursday, 7 February 2019, 12.30pm, Venue near Moorgate, London. Europa Oil & Gas Holdings plc (LON:EOG) Wressle's existing planning approvals.